The Midday Mix-Up. The best of the best local and international music, interviews and korero. Join us everyday at midday to get the coolest drops in the Moana. 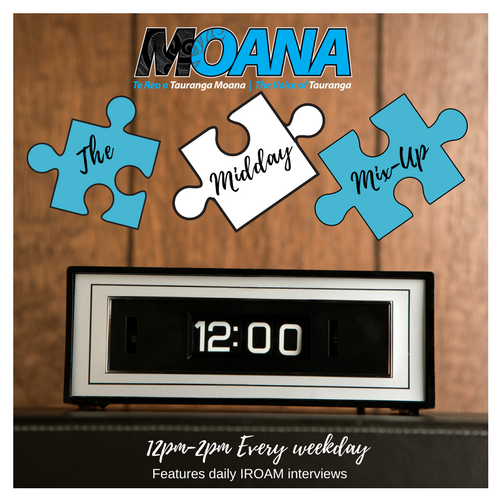 Make sure to check out our new feature, IROAM, bringing you the latest in the Moana and the motu with our roaming reporters. BE IN TO WIN a $100 Pak n Save gift card thanks to E Tū Whānau! He Mihi o te Tau Hōu!! He mihi o te arawheu! A new website has been developed for WBoP region, specifically to support whānau struggling with a new website has been developed for the Western Bay of Plenty region, specifically to support whānau struggling with a loved one or family members impacted by substance abuse. Our new Urupounamu is out. We would love to hear your whakaaro. Tune in to Urupounamu with Justine Murray and Te Kehukehu Butler every Thursday at 11am to hear them discuss the latest Urupounamu. E TŪ WHĀNAU is delighted to announce the WINNERS of the E TŪ WHĀNAU POSTER COMPETITION 2018! Check out Onie's interview with her cousin Te Pae Kuka today on the A & O Show at 4.30pm where they discuss the upcoming 36 degrees Fashion and Art Exhibition coming up this Friday! We thought we'd go a bit lighter with our Urupounamu this week.. Everyday, Aubz and Onie count down 10 things you need to know. Listen in to the show daily from 2pm-6pm on 98.2fm and 1440am.